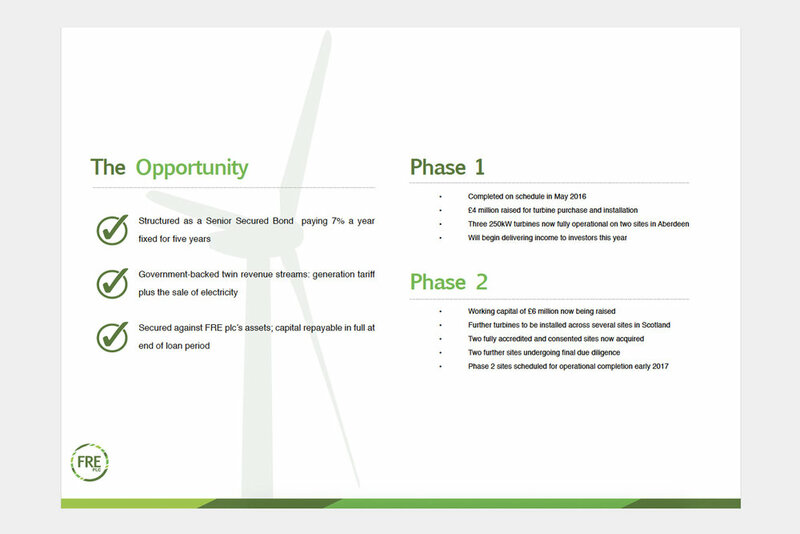 Multi-channel marketing of UK clean energy projects to diverse investors. The Copy Kitchen worked with a group of bond market and private equity specialists in London to promote investment in renewable energy deals. Projects ranged from wind turbines to leading-edge waste-to-energy plants. Marketing materials were developed under a range of brands to variously target mum-and-dad retail investors, high net worth individuals and independent financial advisors. Channels included print brochures, websites, video scripts, investment prospectuses, banner ads, DM emails and news releases. The Copy Kitchen developed compliant messaging tailored for different levels of investment sophistication, including researching and writing clear, accessible market analysis and comparison of investment products. Despite its current economic stasis, Europe also remains a strong proposition for investors considering the renewables market. The relative economic stability of the European Union, its supportive regulatory framework and consistent policies on climate change are all factors in favour of the region. Members of the EU have committed to binding clean energy targets ranging from 10% to 49% by 2020, with a collective commitment to ensuring at least 27% of final energy consumption across the EU comes from renewables by 2030. Alongside the imperatives of climate change, Europe’s rapid move towards greater reliance on renewables is motivated in part by a desire for improved energy security, in particular to reduce reliance on gas imports from Russia and North Africa. While nuclear power continues to have its supporters, many countries are moving to reduce their nuclear power operations in the wake of the Fukushima disaster. Germany has committed to phasing out nuclear altogether by 2022, and even historically staunch proponent France is currently targeting a reduction of its power generated by nuclear to 50%. There is a lack of clear support for investment in nuclear among member states including Sweden, Italy, Spain, Finland, Belgium and The Netherlands. In the UK, despite uncertainty regarding the UK’s exit from the European Union, the Government remains for the time being bound by its EU agreement to generate 15% of its energy requirements from renewable energy sources by 2020. While a quick withdrawal from the EU may allow Britain to relax some aspects of its short-term clean energy policies, longer term the UK remains bound by its own Climate Change Act. This Act, passed in 2008, imposes an 80% reduction in carbon emissions on 1990 levels by 2050, a target even higher than that required by the EU. While the Hinkley Point C power station was given the green light in September 2016, the new plant is unlikely to be operational before 2026, and in the meantime energy commentators predict a significant shortfall in energy supply. In the intervening decade the UK will likely see the continued decentralisation of energy supply to meet short-term demand, improve UK energy security and continue to cut emissions. Many observers believe the country’s energy supply problems will be best solved by a smart, efficient, widely distributed network powered increasingly by low-carbon sources. As the UK moves towards a possible EU exit, domestic energy security – in which renewables will play a key role – is likely to move higher up the agenda, with Britain potentially finding itself excluded from the proposed EU supergrid, and the cost of connection from outside the EU remaining a significant unknown.